This album spread depicts the bride preparation for her Roma's Hospitality Centre wedding day. 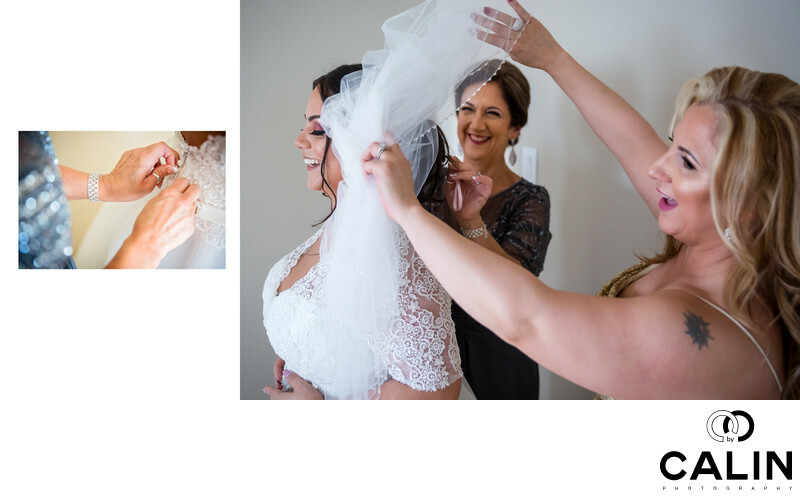 In the left image, see a detail shot that captures the moment when the mother of the bride helped her put on the wedding gown. As a Toronto wedding photographer, I learned that my clients value not only epic pictures but also shots that immortalize important moments on their wedding day. The left image on this album spread is documentary in its nature although there are elements of composition that increase its artistic value. The mother of the bride her hands in the back of the dress are all placed along the baroque diagonal. That gives the image dynamism. The image on the right is what I like to call posed photojournalism. Like a movie director, I like to set the scene and give the people loose directions. However, this image happened organically and the reactions are natural. As usually, everything revolves around light. The bride is on the left of the frame facing the window so she's the brightest part of the frame and the main subject in the picture. In the centre of the image we can see the mother of the bride helping her put on her veil. Finally, on the right, the bride's oldest sister he's also helping her with her veil. All three ladies are genuinely laughing, which makes this a lovely wedding picture that the bride will cherish for many years to come. In terms of composition, I used a few elements that make this an outstanding image. First, there are three people in this image, and according to the rule of odds that makes this shot appealing. Second, the sister's hands are creating radiating lines that frame her mother and lead our eyes towards the bride. The veil is parallel to the baroque diagonal and combine with the sisters hands form an arabesque.